Throughout my 20’s I organized my home with an intensely tight budget. 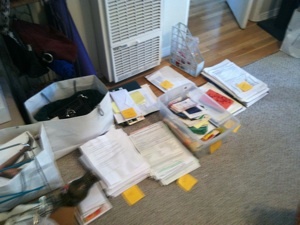 I feel that that is one of my strengths as a professional organizer: organizing space on a budget. How do we become organized and not feel overwhelmed to do yet another project and spend more money getting it done? While many of life’s project’s can be overwhelming, Brass Tacks clears the clutter so you can breathe. I try not to make space look overwrought or sterile. Shoot, I love a good junk drawer! However, the power of feeling that you own your space and feel a flow within it comes from the things we can let go. I try to help you create and personalize that flow. The first step to organizing is de-cluttering. De-cluttering is the most time consuming and emotional part to REALLY getting organized. It is also the reason why it’s very difficult to devote the time to doing it alone. Even the most organized can’t see things the way an outside eye can. That’s why I often use my friends to remind me why I should or should NOT keep a shirt-dress that I never wear and doesn’t quite fit me the way I’d like. I have clients that look at their space and say “I can do it myself”. But the reality is, they HAVEN’T. That’s why they hire me. Sentimental boxes, old pictures and cards, that shirt we wore on our first date with an ex: these things need to be looked at. We all need help. We shouldn’t waste our personal real estate and rent money on housing things we no longer need. I’ll admit it, I have a mild form of OCD. There I said it. This makes me passionately drawn to what I do and what fires that passion even more is knowing that I can help someone. Because Jeebus knows we all need that help.